Update, August 26: Monster Hunter: World is now officially Capcom’s biggest-selling game ever, with 10 million copies sold worldwide. That includes digital sales since the game’s launch on Steam, which are estimated to account for at least 2 million copies sold. 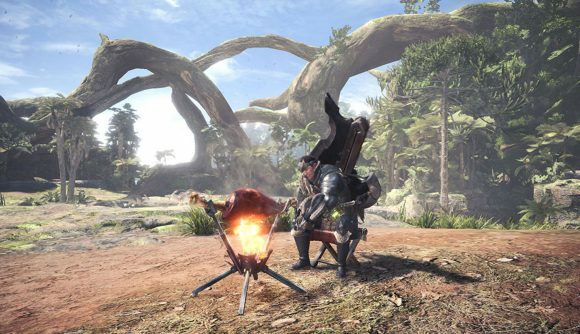 Monster Hunter: World was already an astronomical success almost as soon as it launched August 9. It quickly rose to the number four slot on Valve’s client by current player numbers, and cracked the top ten of Steam’s biggest concurrent player counts – ever. Hours after it launched on Steam, concurrent player counts exceeded 200,000, putting Monster Hunter just behind Steam’s regular top three trio of PUBG, Dota 2, and CS:GO. Even in fourth place, that puts Capcom’s latest beyond the likes of GTA5, Rainbow Six Siege, and even massive free-to-play titles like Warframe – it’s astronomical degree of success no matter how you slice it. Capcom announced that Monster Hunter: World was the best-selling game in company history this week, following its PC launch on Steam. The Monster Hunter series as a whole, Capcom says, has now sold more than 50 million copies over the run of the series. Monster Hunter: World sales numbers already painted it as Capcom’s biggest game ever, and that was announced just a handful of months after the console release back in January. It seems the lengthy delay for this port didn’t do much to dampen anticipation for the series first jump to western PCs. SteamSpy estimates the number of PC copies owned is anywhere between 2 and 5 million, and the game’s player count has held strong at around 270,000 peak concurrent players each day.